When it comes to packing, I almost always end up bringing things I don't necessarily need... however, my quick trip to South Carolina required this. 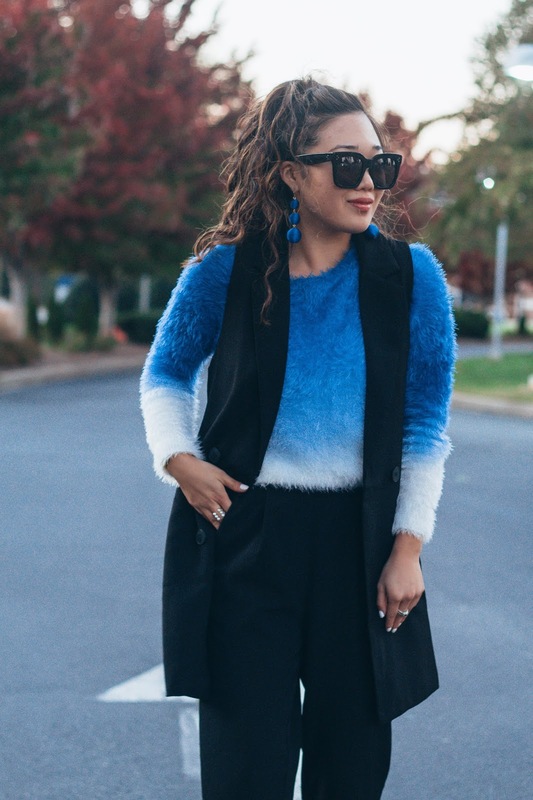 This blue fuzzy sweater. This past weekend, I flew to Charlotte, NC and then drove to Spartanburg, South Carolina to attend my sister's white coat ceremony for her medical school. Much to my surprise... it was so cold. And even though I escaped the NY city scene, little did I know that it would be chillier down in the south. What are the odds, right? The fashion blogger that I am packed two looks for the day trip. Here was my first one. If you follow me on Snapchat, you probably saw me post about how the pilot thought I was the stewardess on the plane because of my outfit. Haha. As for the second look, the temps suddenly dropped in the late afternoon and the wind was out of control. You can't really tell in the photos, but in some of them where I'm smiling, I'm actually trying to contain my laughter because my mom and I were freezing while taking these and her coat was flying up and everything! It was quite a sight. This sweater really did come in handy though because it kept me warm all night. Anyone else ever have unexpected situations like this? I'd love to hear them!